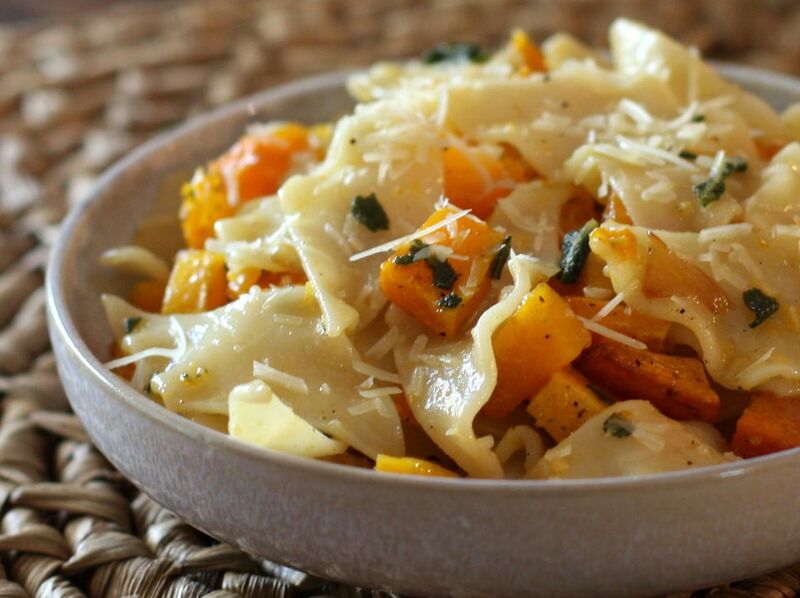 Butternut squash, browned butter, and sage flavor this simple pasta dish and make it somewhat special. This is a delicious way to enjoy butternut squash, but you can also use another winter squash like kabocha or an edible pumpkin in this dish. Be sure to cut the squash into evenly sized pieces to ensure it all roasts evenly. The rich fall flavors will make this pasta dish a seasonal favorite. It is perfect the way it is, but feel free to change or add to the recipe to make it your own. For some additional texture, taste, and protein, add some cooked white beans or baby lima beans. Use rombi pasta, farfalle, homemade gnocchi, or your favorite pasta shape. If you prefer, you could make this dish into more of a casserole or baked pasta dish. Follow the instructions, but cook the pasta just less than al dente. After you toss the mixture together, put it all into a baking dish, top with your favorite cheese (or cheeses), and cook until the top is melty and gooey. The result will be an adult version of a fall macaroni and cheese. Use a vegetable peeler to peel the squash. Scoop out the seeds and cut into 1/2- to 1-inch cubes. Combine squash, chopped onion, 1 scant teaspoon kosher salt, 1/8 teaspoon pepper, and olive oil. Toss to coat and spread out in a large jelly roll pan or roasting pan. Roast for about 30 to 35 minutes, or until tender and lightly browned, turning about halfway through the roasting time. Meanwhile, cook pasta as directed on the package; drain and rinse with hot water. Set aside. In a large saucepan or skillet over medium-low heat, cook butter and sage leaves until the butter begins to brown. Add the garlic and continue cooking for about 1 minute. Make sure to not let the butter burn. Remove from heat and remove the sage with a slotted spoon; crumble the sage with a spoon. Add the cooked and drained pasta to the butter mixture along with the crumbled sage and roasted butternut squash and onions. Put back on the heat and continue cooking, stirring, until pasta and squash are hot. Toss with the 1/2 cup of shredded Parmesan cheese just before serving. Garnish with more Parmesan if desired. If you are a fan of butternut squash and would like to add a few new recipes to your repertoire, there are several interesting dishes to make with this delicious squash (in addition to soup!). Try butternut squash bake with cinnamon brown sugar crumb topping. This is the ideal side dish for kids who are reluctant to eat their vegetables. Autumn sausage stew with butternut squash is fall in a dish and a comforting meal on a cold night. If you are looking for something simple, roasted butternut squash on its own is a tasty side dish that goes well with many main dish recipes.